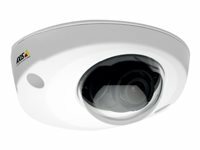 Video surveillance in vehicles The AXIS P3904-R is a high-performance camera specially designed for mobile video surveillance in buses, trains, subway cars and emergency vehicles. Vibration resistance and tampering alarm The camera has protection against dust and water, and can withstand tough conditions such as vibrations, shocks, bumps and temperature fluctuations. The active tampering alarm can detect tampering attempts such as blocking or spray-painting. HDTV quality video and traffic light mode AXIS P3904-R has support for HDTV 720p. The camera is specially adapted to respond quickly to changes in light levels, ensuring that high image quality is maintained. Traffic light mode helps to better distinguish colors of traffic lights in very dark scenes. The use of progressive scan also produces clearer images of moving objects. The pixel counter helps verify that the pixel resolution of an object or face meets regulatory or specific customer requirements. Quick and reliable installation The camera is designed for quick and reliable installation. The desired field of view and a leveled image can be easily achieved by using the supplied lens tool to direct and rotate the ball that holds the lens and image sensor. Since the AXIS P39-R Series shares the same physical interface as the preceding model, the AXIS M31-R Series, upgrades of existing installations are quick and easy. 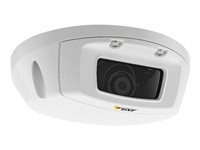 Video surveillance in vehicles and rolling stock AXIS P3904-R is a high-performance network camera specifically designed for mobile video surveillance in buses, trains, subway cars, and emergency vehicles. The camera has protection against dust and water, and can withstand tough conditions such as vibrations, shocks, bumps, and temperature fluctuations. Excellent on board image quality AXIS P3904-R Mk II is specially adapted to deliver sharp HDTV 720p image quality onboard moving vehicles with varied and fast-shifting light levels. The camera features WDR - Forensic Capture for clarity when there are both dark and light areas in the scene, and Axis Lightfinder technology for color images even in near darkness. Traffic Light mode helps to better delineate the color of traffic lights in very dark scenes. Cut the storage, not the quality AXIS P3904-R Mk II features Axis Zipstream technology, which reduces storage and bandwidth, while capturing important details in full image quality. The result is high-forensic usability, and significant savings, as well as a camera that's perfect for onboard conditions. Quick and reliable installation The camera is designed for quick and reliable installation. A lens tool that makes it easy to get a level image with the field of view you want is included. 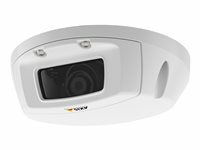 Video surveillance in vehicles The AXIS P3905-R is a high-performance camera specially designed for mobile video surveillance in buses, trains, subway cars and emergency vehicles. HDTV quality video and traffic light mode AXIS P3905-R has support for HDTV 1080p. The camera is specially adapted to respond quickly to changes in light levels, ensuring that high image quality is maintained. Traffic light mode helps to better distinguish colors of traffic lights in very dark scenes. The use of progressive scan also produces clearer images of moving objects. The pixel counter helps verify that the pixel resolution of an object or face meets regulatory or specific customer requirements. Excellent onboard image quality AXIS P3905-R Mk II is specially adapted to deliver sharp HDTV 1080p image quality onboard moving vehicles with varied and fast-shifting light levels. The camera features WDR - Forensic Capture for clarity when there are both dark and light areas in the scene, and Axis Lightfinder technology for color images even in near darkness. Traffic Light mode helps to better delineate the color of traffic lights in very dark scenes. Cut the storage, not the quality AXIS P3905-R Mk II features Axis Zipstream technology, which reduces storage and bandwidth with up to 50%, while capturing important details in full image quality. The result is high-forensic usability, and significant savings, as well as a camera that's perfect for onboard conditions. Optimized for transportation AXIS P3905-R Mk II complies with a long list of transportation-industry regulations including fire-safety, and EN50155:2017 Class OT2/ST2 (EN50155:2007 Class TX) standards. 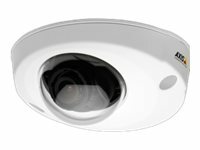 Its rugged design and ability to withstand a wide range of temperatures make the camera appropriate for tough onboard conditions. And with optional outdoor housing, M12 or RJ45 connectors available and a compact and discreet design, it's flexible enough to be installed inside or out and in many different configurations. Quick and reliable installation The camera is designed for quick and reliable installation. A lens tool that makes it easy to get a level image with the field of view you want is included. And it's easy to upgrade from earlier camera versions from the series. AXIS P3905-R network camera is specially designed for video surveillance in vehicles and rolling stock. The compact, discreet, and rugged camera can withstand tough conditions such as vibration, shock and temperature fluctuations. The camera provides HDTV WDR to ensure high image quality in mixed and low-light conditions. HDTV quality video AXIS P3905-RE has support for HDTV 1080p. The camera is specially adapted to respond quickly to changes in light levels, ensuring that high image quality is maintained. Traffic Light mode helps to better distinguish colors of traffic lights in very dark scenes. The use of progressive scan also produces clearer images of moving objects. The pixel counter helps verify that the pixel resolution of an object or face meets regulatory or specific customer requirements. Quick and reliable installation The camera is designed for quick and reliable installation. The desired field of view and a leveled image can be easily achieved by using the supplied lens tool to direct and rotate the ball that holds the lens and image sensor. Power over Ethernet support further simplifies installation since only one cable is needed for carrying power and video. Video surveillance on vehicles The camera has protection against dust and water, and can withstand tough conditions such as vibrations, shocks, bumps and temperature fluctuations. The active tampering alarm can detect tampering attempts such as blocking or spray-painting. HDTV quality video and traffic light mode AXIS P3915-R has support for HDTV 1080p. This model also has an audio-in and I/O capabilities. The camera is specially adapted to respond quickly to changes in light levels, ensuring that high image quality is maintained. Traffic Light mode helps to better distinguish colors of traffic lights in very dark scenes. The use of progressive scan also produces clearer images of moving objects. The pixel counter helps verify that the pixel resolution of an object or face meets regulatory or specific customer requirements. Quick and reliable installation The camera is designed for quick and reliable installation. The desired field of view and a leveled image can be easily achieved by using the supplied lens tool to direct and rotate the ball that holds the lens and image sensor. Since the AXIS P39-R Series shares the same physical interface as the preceding model, the AXIS M31-R Series, upgrades of existing installations are quick and easy. Power over Ethernet support further simplifies installation since only one cable is needed for carrying power and video. Excellent onboard image quality AXIS P3915-R Mk II is specially adapted to deliver sharp HDTV 1080p image quality onboard moving vehicles with varied and fast-shifting light levels. The camera features WDR - Forensic Capture for clarity when there are both dark and light areas in the scene, and Axis Lightfinder technology for color images even in near darkness. Traffic Light mode helps to better delineate the color of traffic lights in very dark scenes. Cut the storage, not the quality AXIS P3915-R Mk II features Axis Zipstream technology, which reduces storage and bandwidth with up to 50%, while capturing important details in full image quality. The result is high-forensic usability, and significant savings, as well as a camera that's perfect for onboard conditions. Optimized for transportation AXIS P3915-R Mk II complies with a long list of transportation-industry regulations including fire-safety, and EN50155:2017 Class OT2/ST2 (EN50155:2007 Class TX) standards. Its rugged design and ability to withstand a wide range of temperatures make the camera appropriate for tough onboard conditions. And with optional outdoor housing, M12 or RJ45 connectors available and a compact and discreet design, it's flexible enough to be installed inside or out and in many different configurations. AXIS P3915-R Mk II also offers audio-in, and 4-pin digital I/O ports for integration with other equipment.